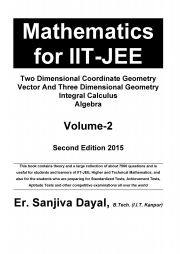 Description of "Mathematics for IIT-JEE"
This book contains theory and a large collection of about 7500 questions and is useful for students and learners of IIT-JEE, Higher and Technical Mathematics; and also for the students who are preparing for Standardized Tests, Achievement Tests, Aptitude Tests and other competitive examinations all over the world. Indian Institute of Technology Joint Entrance Examination (IIT-JEE) is considered to be one of the toughest competitive entrance examinations in the world with success ratio well below 1%. The author of this book Sanjiva Dayal was selected in IIT-JEE in his first attempt. After completing B.Tech. from IIT Kanpur, since the last more than 25 years, he has been teaching IIT-JEE Mathematics to the students aspiring for success in IIT-JEE and other engineering entrance examinations with an objective to provide training of the highest order by way of specialized and personalized oral coaching, teaching, training, guidance, educational facilities including tutorials, tests, assignments, reading materials etc. and all such facilities which are helpful to the students seeking admission in the IIT and other Engineering Institutes of India. His excellent teaching and result-oriented methods have combined to produce outstanding performance by his students in the past years. A large number of his students were selected in their First Attempt with top ranks. Most of his students have secured admission in the IIT and other Engineering Institutes of India and they are doing well in their engineering education and professional career also. Conceptual understanding of Mathematics provided by him not only helps his students to do well in the IIT-JEE and other engineering entrance examinations but also helps them to do well in their engineering studies where they are pitted against the best students of the country and competition is much more intense. Reviews of "Mathematics for IIT-JEE"